Temprid FX combines the fast-acting, broad-spectrum control of beta-cyfluthrin with the systemic residual control of imidacloprid to provide premium performance and efficacy. Not only has it been proven to be incredibly effective against bed bugs, but it also controls ants, roaches, mosquitoes, termites, and tons of other pests. Kills most of a population immediately, and offers up to 6 months of residual protection. Effective against bed bugs of all ages and their eggs. Homeowners and professionals alike should give Temprid some serious consideration. This dual-action spray has been proven to be incredibly effective in controlling bed bug populations, including strains that are resistant to conventional pyrethroids. The secret to Temprid’s success is in its dual-action formula. Combining beta-cyfluthrin with imidacloprid gives Temprid quick knockdown power as well as long-lasting residual effect. A single application of Temprid can control bed bugs (as well as tons of other pests) for up to six months. 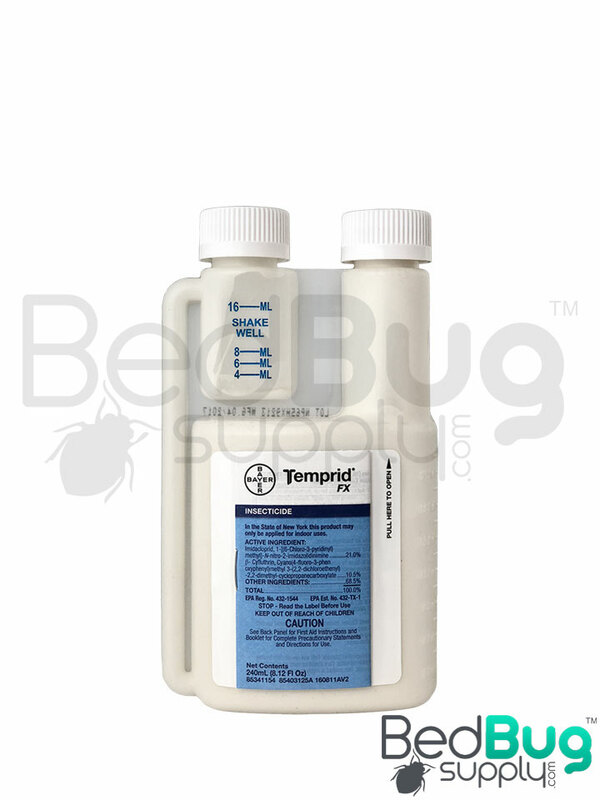 Unlike many heavy-duty bed bug sprays, Temprid is labeled for use on carpet and upholstered furniture. It has low odor, doesn’t stain, and the residue leaves a clean surface when it evaporates. Using Temprid is simple. All you need is a spray tank and some water. Mix 8 mL of Temprid with a gallon of water and shake it up, and you’re ready to rock. You can apply Temprid on the folds and seams of your mattress, box spring, or upholstered furniture. You should also spray along cracks and crevices in your floors, behind the baseboard of your bed, and behind hanging mirrors and picture frames. For best results, spray once a week until your infestation is fully treated. Temprid has been flying out the door since we began carrying it, and for good reason. It’s a great bed bug fighter at a great price, suitable for both residential and commercial applications. 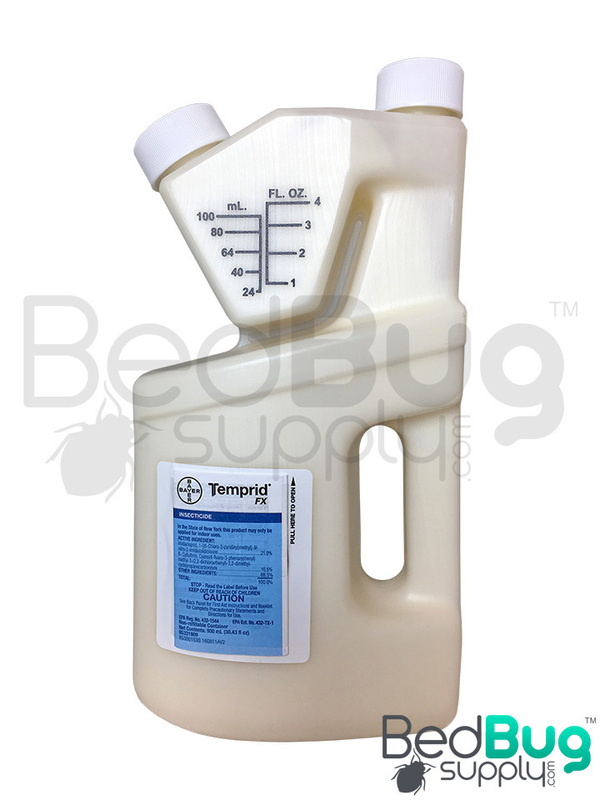 If you are serious about taking down your bed bug infestation, start using Temprid right away. Temprid FX offers a unique dual-action approach, combining two residual insecticides with great results. The combo offers a quick initial knockdown of the bed bug population, and up to 6 months of residual protection. This compound has been in use for over 5 years, and has been proven effective in a number of third-party research studies. Temprid FX is a liquid concentrate product; mix 0.27 fl oz (8 milliliters) of Temprid FX with a gallon of water in a spray tank, and you're ready to go. For indoor use, spray in cracks and crevices along baseboards, floor coverings, carpets, furniture, and hanging picture frames. Temprid works especially well as a perimeter control for many pests - spraying outside of your home, especially around the foundations, will help ward off over 50 types of pests. Many bed bug strains have grown resistant to synthetic pyrethroids, which have been in use for many years. 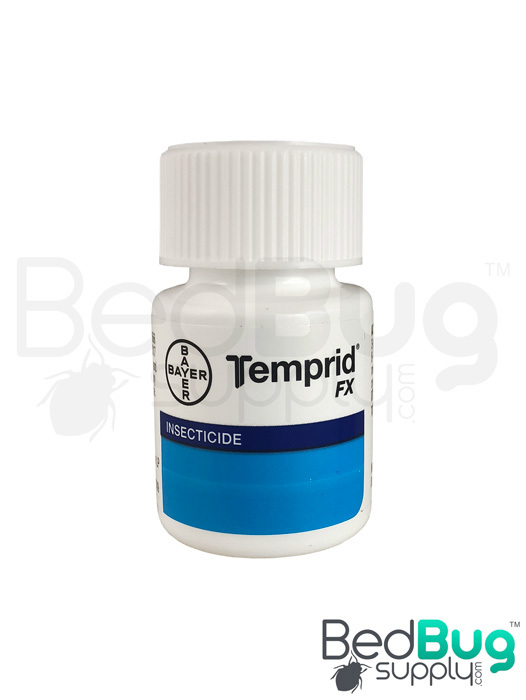 Temprid FX's dual-action formula is effective against all strains of bed bugs, even killing eggs and newly-hatched nymphs. It doesn't stain, has minimal odor, and is safe for use on virtually any surface found throughout your home. It is even safe for use before a heat treatment - a portable heater, like a PackTite, won't damage anything that has been treated with Temprid. Using Temprid is easy for homeowners, property managers, and pest control operators. To get started, all you have to do is mix 8 mL of Temprid with a gallon of water, shake it up, and start spraying. A single application of Temprid will protect the perimeter against over 50 types of pests for up to 6 months. Unlike most competing perimeter control products, Temprid is backed by a money-back satisfaction guarantee. Q: What respirator would you recommend when using this product? We don't have specific recommendations for respirators and other PPE, as long as they meet NIOSH approval and the appropriate regulatory standards. Reviewed by: Robb the bug guy from Detroit. Haven't used yet ,jus got pacemaker..researched this product..& only good reviues from scientific community..decided to get when I realized exterminanator had hooked apt. Building owner with the "perpetual pestcontroll hustle".. That's where you use something like transport (strong repellant activity) in a multy family dwelling (6 floor apt. Bldg. )..he sprays 1 apt. & runs bugs left-right -up-down..spreading problem..then tells management tennents are dirty.. Reviewed by: James Zeise from Va.. The product is effective and lasting. The price compared to the other brand insecticide is a little on the higher side. Reviewed by: Paddy from Paris. Reviewed by: John Smith from Columbus Ohio.